Summary: It’s too late to evacuate. Now all they can do is try to survive. Under the threat of Hurricane Danielle, Houston residents are ordered to evacuate. For Jillian McKay, that means a long car ride with her neighbors, River Daughtry and his dad. River was the star quarterback of Harrison High until he was mysteriously expelled and sent to juvenile detention. He returned a loner, with no sign of the spark he and Jillian once shared. Now on the road, stuck in miles of gridlock, they’re barely speaking. But River thinks they won’t get out of the city in time. He wants to ditch the evacuation plan, even if his dad doesn’t. Crazy as River sounds, Jillian has a feeling he’s right. The two set out by themselves and break into their abandoned school for shelter. The dark hallways unleash memories, and as the hurricane descends, Jillian can see that River is confronting a storm of his own. Together they discover that survival is about more than just staying alive—it’s about fighting for yourself. Being evacuated due to a category-5 hurricane puts on enough pressure. But on top of that, being forced to spend hours in the car with her neighbor and former classmate River Daughtry (who she once shared a kiss with but hasn’t spoken to since he was sent to juvie) and his ex-marine father isn't something Jillian is sure she's prepared for either. But as the storm progresses and traffic doesn't, the original plan to stay in the car and make it safely out of the area begins to seem futile. And once Jillian and River abandon the safety of the car and River's dad, who refused to budge from the SUV, there's only so much time to get back to their school and hide out until Hurricane Danielle blows over. If they can make it that long. I liked that the storm was definitely a main focus in Hurricane Kiss but not the main focus; this book isn't just about a hurricane -- it's about much more than that. This is River and Jillian's story, not Danielle's. Both River and Jillian have been through their own personal tragedies; and as they're forced into close quarters inside the school, will they find a way to survive not only the storm outside but the ones inside themselves? 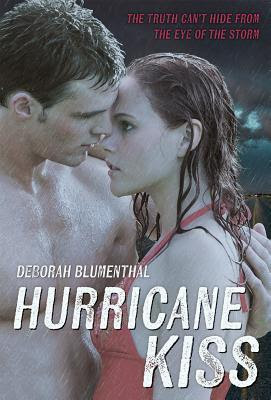 I really enjoyed Hurricane Kiss; it was a fast read, and the writing and characters were captivating. And being the huge weather/meteorology enthusiast I am, I also loved the countdown to the hurricane's landfall. I recommend it for readers of contemporary and Teen/YA fiction. Sounds like a good read! I;ll have to pick it up! I like the sound of this one. I love when characters are forced together in life and death situations! Also, it sounds swoony and I like swoony. Great review! I am a sucker for books that feature hurricanes, I don't know why. I think I would like this one. I haven't heard of it, but then again, I am completely out of the book loop. I read a book not too long ago that took place during a hurricane and I wanted to blow the heroine away. lol. This sounds more promising! Love that it took place during/counting down towards such a big storm! I know from experience, hurricanes can be so dangerous. But this book pulls me in, as do the characters and the concept of the book. Lovely review, girl! !